would like to build this burner you can order the prints from http://www.model-engine-plans.com/. 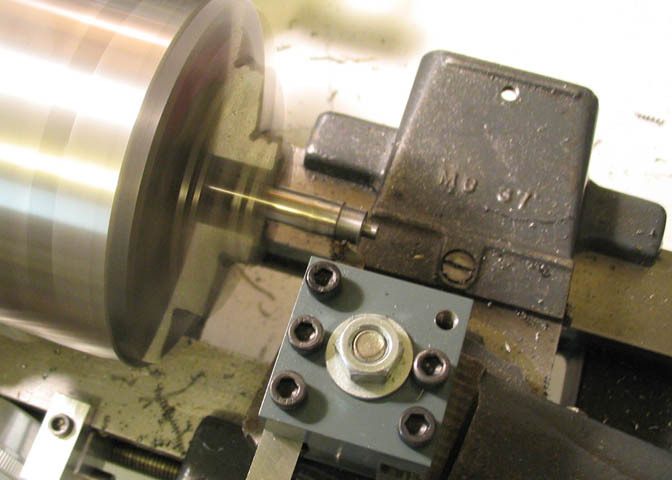 dimensions in this article except for their use in explaining certain machining procedures. Everything you need to know is on the prints, and I urge you to buy them from the Howell family. It's only $6.00! in the end. The prints show how to make it using a slightly different method than I'll show here. 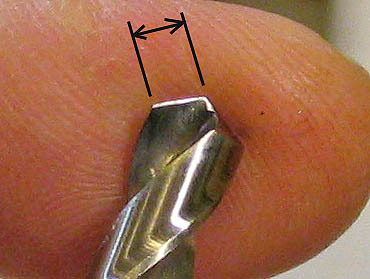 a standard numbered drill size to make good use of it. 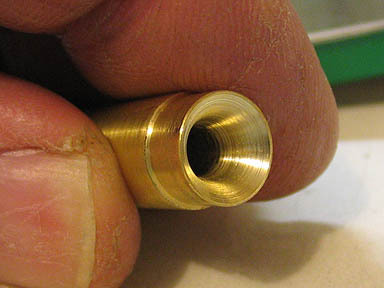 may not take to press fitting as readily as this brass bushing. part is KWM brand, #L56 bushing. Don't let the small size scare you off. It's not that hard to work with. and you need a way to hold it. Spot the face of the arbor, then drill and tap for the 2-56 screw. Once the arbor is tapped, thread in the screw and snug it up. Not too tight, as it's pretty small. then spot the center just deep enough to start a small drill bit. 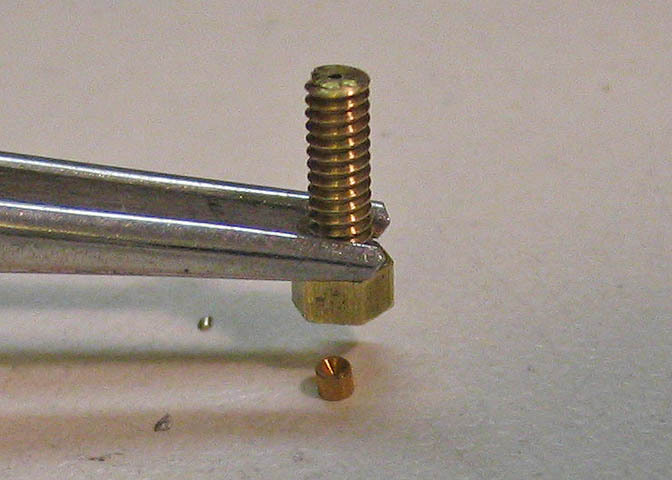 bit this small with many drill chucks, so I put it in a pin vise, then set it up like in the next picture. 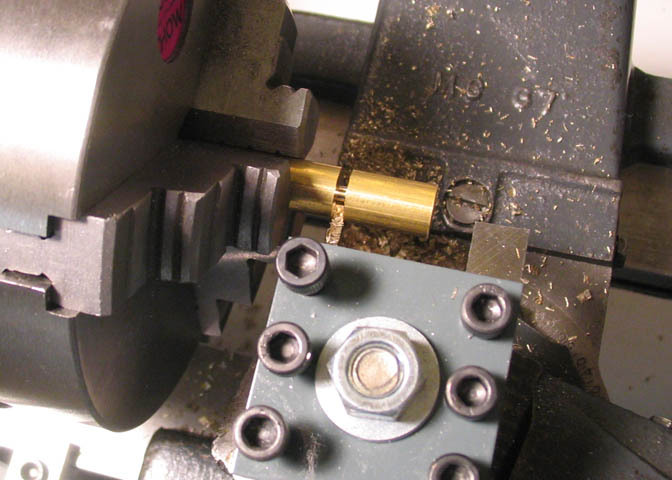 as a guide, but the pin vise is free to spin in the chuck. which will often break it. Just go easy. 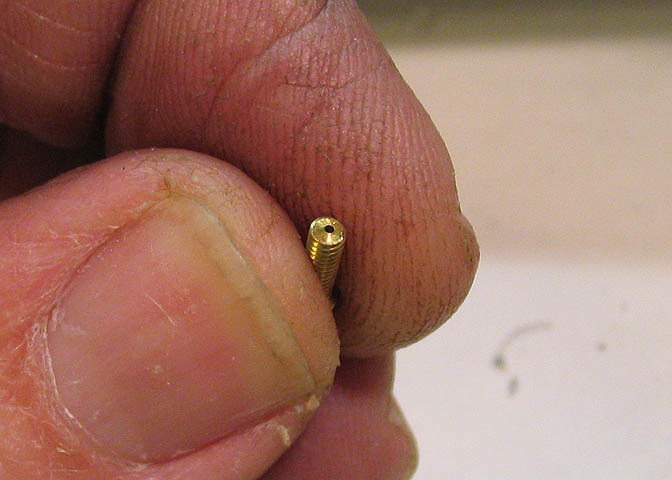 It only takes about one minute to drill an .020" dia hole 3/8" deep. 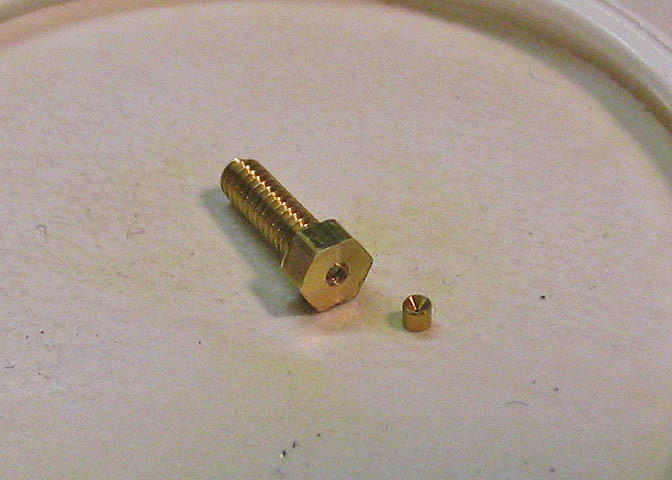 Here you can see where the bit came out the other end of the screw. Sorry for the fuzzy picture here! you have superman eyes, but you can get pretty close by marking the drill bit. a larger hole into a smaller one. 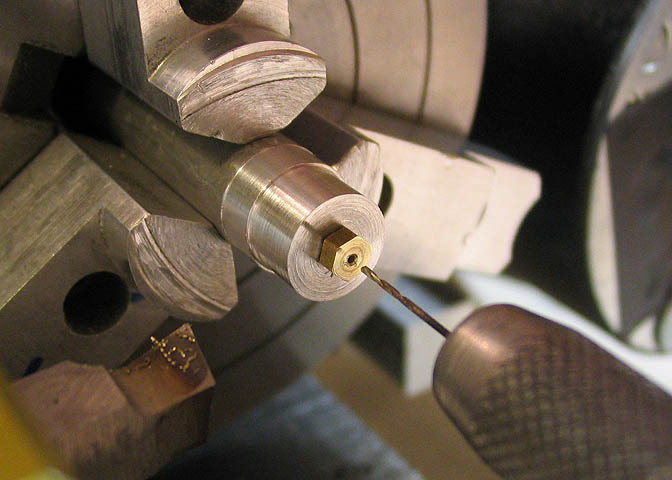 Once this part of the bore is done, the screw can be taken out of the arbor. 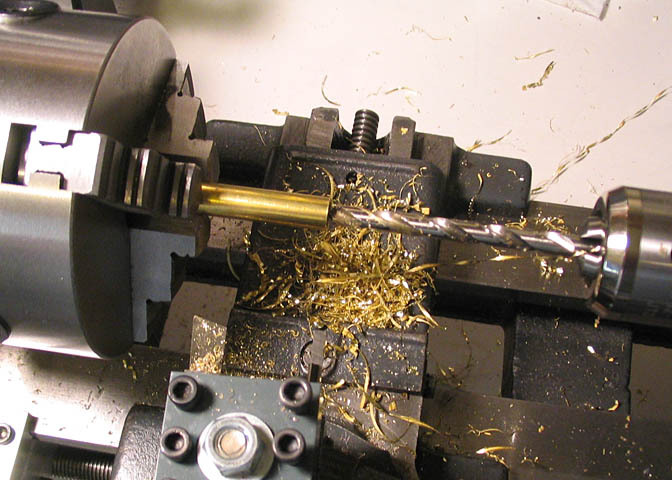 To take the edge off a drill to make it work well in brass without grabbing, follow these steps. 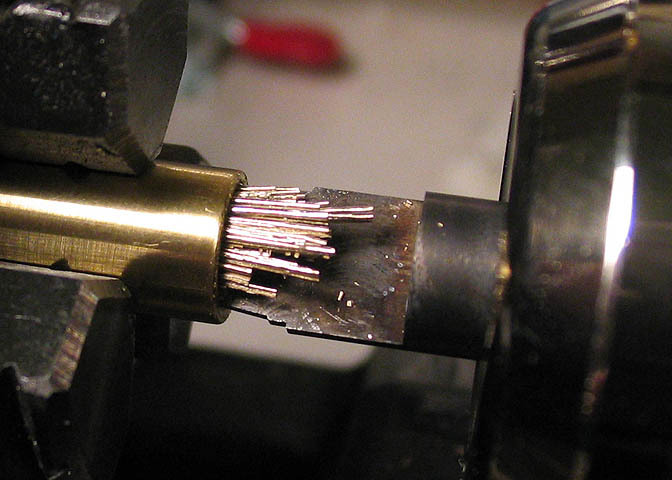 I keep an extra set of drill bits that are all honed to cut brass properly. quite a lot of force, sometimes breaking the bit, sometimes ruining the work. hard arkansas stone to hone the cutting lips slightly flat. 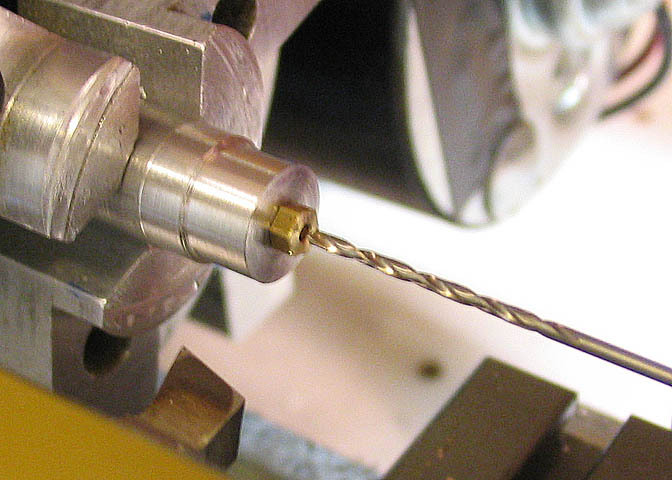 to drill the larger hole is supposed to make a .046" bore, but probably makes it just a little larger. 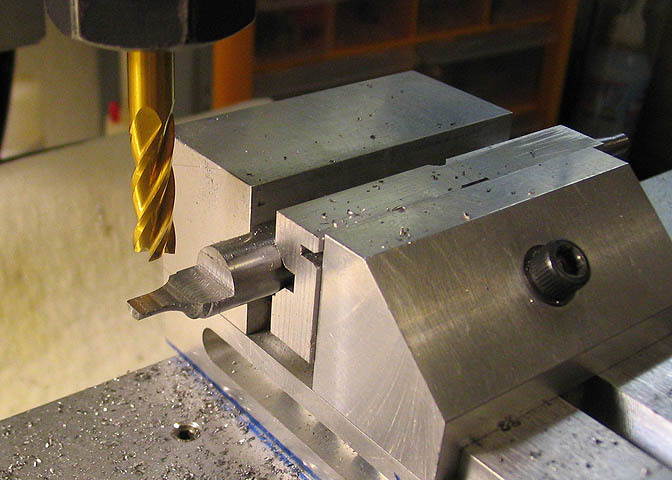 edge of the hole, a 1/16" drill bit is used and turned a few rotations while holding it in the pin vise. I think you can see the bevel fairly well here. It'll give the bushing a place to start. Now you just have to get the bushing in the hole, and everything will be dandy. in the hole in the screw. The end that will be showing when it's done is the flat end. whacks with a small, hard plastic headed hammer, and it will go home. red thing is an M&M candy. This might seem easy to some, and maybe somewhat difficult to others. It's not a hard job. 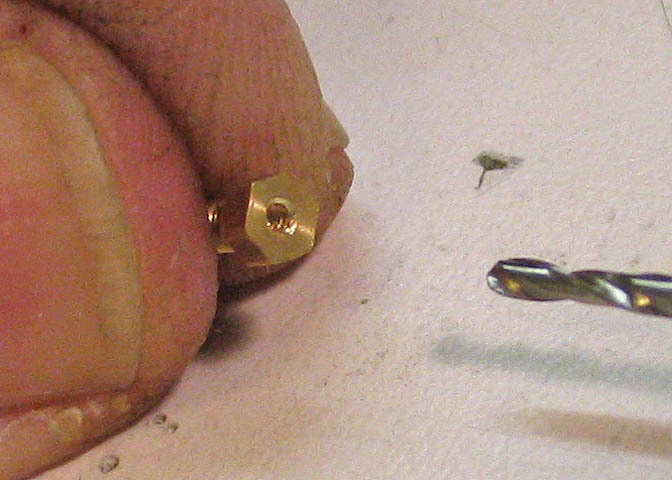 have a way to drill ultra small holes and you need a jet, it might work for you. Time to move on to the main part of the burner. and being a knot head, just kept at it. time from one end to the other. Above, it's done for the moment and being parted off. tubing made in the proper size, but I don't have any on hand, so it will be made from a piece of 3/8"
that will take a small boring bar. use up this piece just to get rid of it, so it's being used to make this sleeve. you normally want to work with. they're formed. Very nice, but this ain't it. close running fit to the body piece that was done earlier. 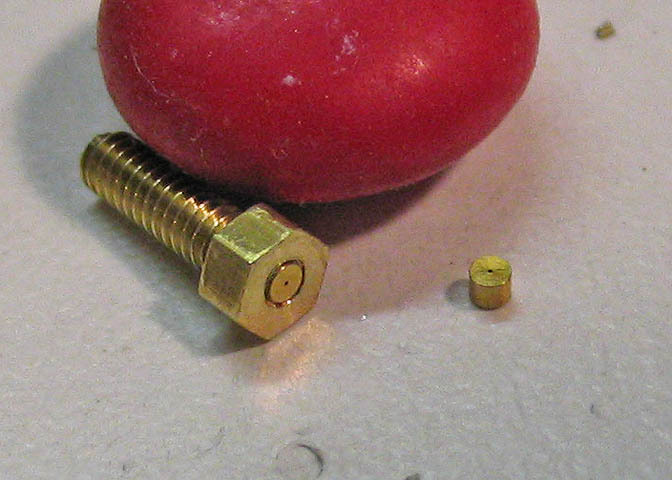 I used a long 2-56 cap screw in one end of the body piece to make sure it fit properly. Sliding it all the way into the end of the hole makes sure I have no taper that will trip me up later on. push it into the bore, air pressure pushes it back out. With the bore in the sleeve done, it's parted off. ruined as the parting tool goes through. tube walls in upcoming operations. The mandrel is a disposable item. 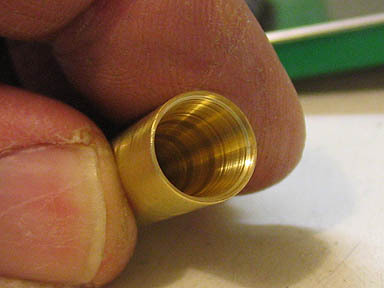 which are form reaming, so it's best to make sure you have 360 brass for this one. The end of the venturi fits into the body sleeve, and that part is being turned here. 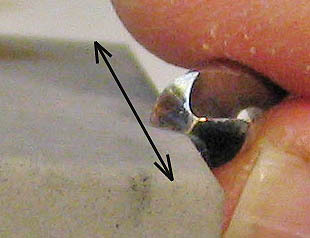 through the piece, you might be best to drill half way from each end to minimize the error. The majority of that hole will be cleaned up with a reamer. 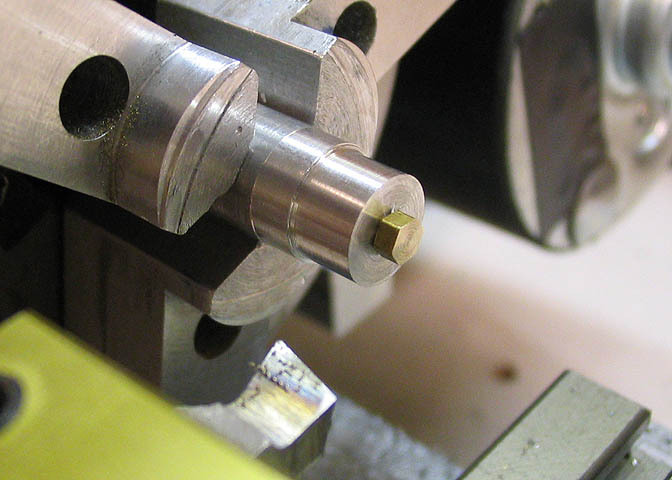 To form the inside of the venturi piece, you need to make a custom cutter, (two of them, really). 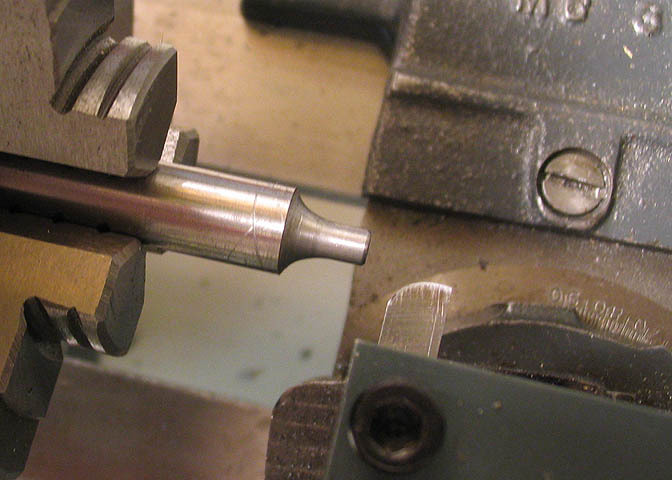 To start, a HSS tool bit is ground to a radius that matches the bell shape in the short end of the venturi. Stick with me here. You'll see what I mean in a just a bit. 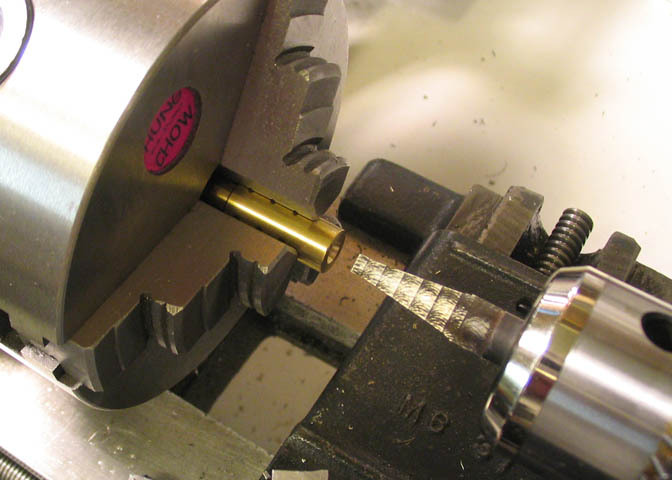 the cutter the same time you are grinding the radius. of the rod, it was good. different cutting tools, and it will be easier to hold for some operations that will be done later. 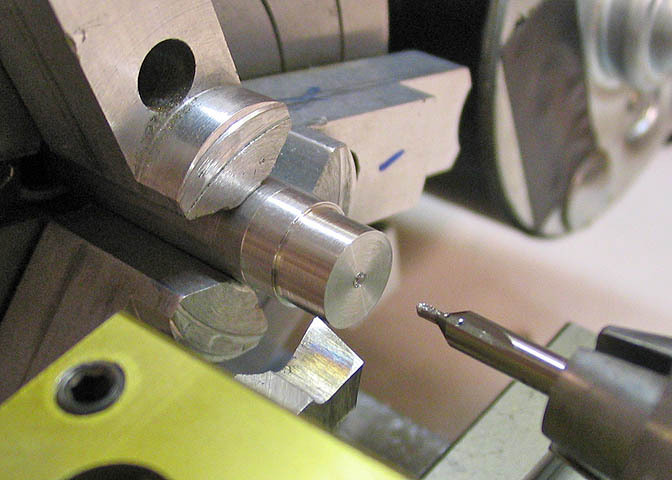 The tool bit with the radiused end is used to cut the profile that represents one end of the venturi, like so. 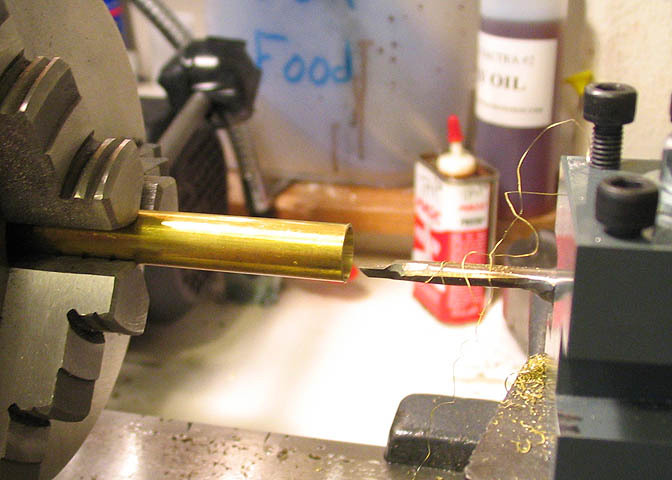 that and pretty soon you end up with a nice sort of bell shape on the end of the drill rod. will help cut down on the chatter. 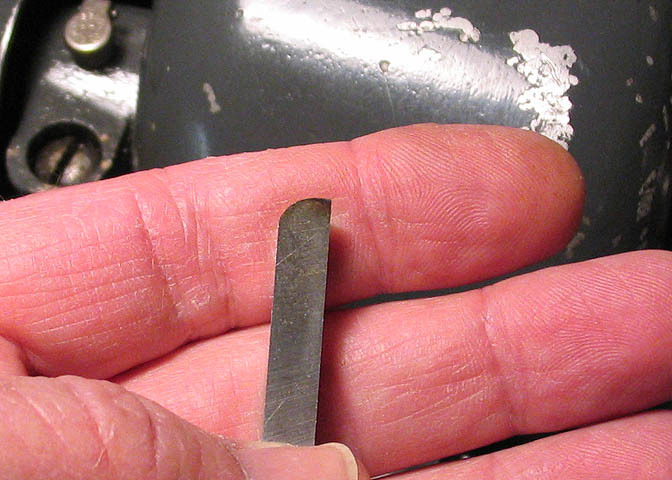 There is one more small cut to be made directly behind the end of the radius. I won't show that. It's just a straight cut made with a regular pointed turning tool. a slight curve to the taper on the drawing, but from looking at it a while, I figured it was straight. 7 degrees. I doubt very much that the taper on this end is critical. needed to be cut. Then put the taper between them. speed, which shined it up fairly nicely. 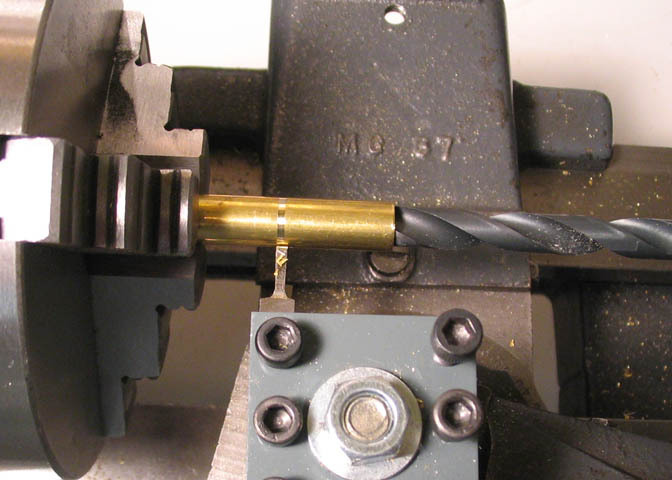 Drill rod isn't known for it's fine turning properties. the cutting tip and it cleans up pretty decent. Here's a shot of the piece with the turning work done. 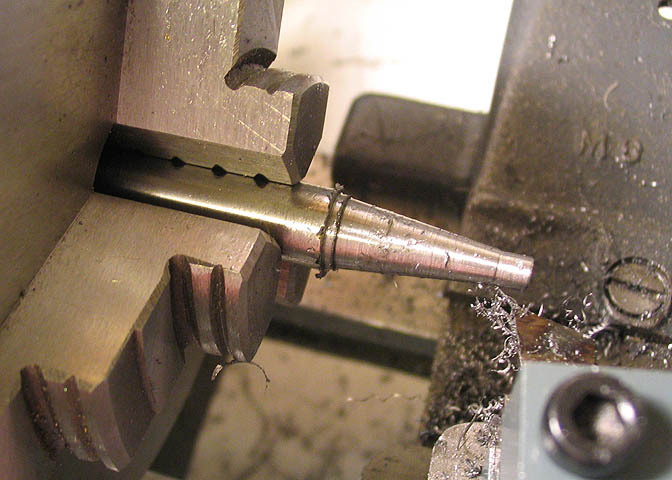 This is where we turn the piece into a forming reamer. 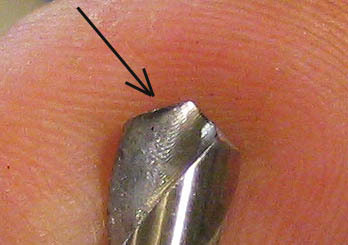 This type of reamer is often called a "D bit". really matter. One is the same as the other. 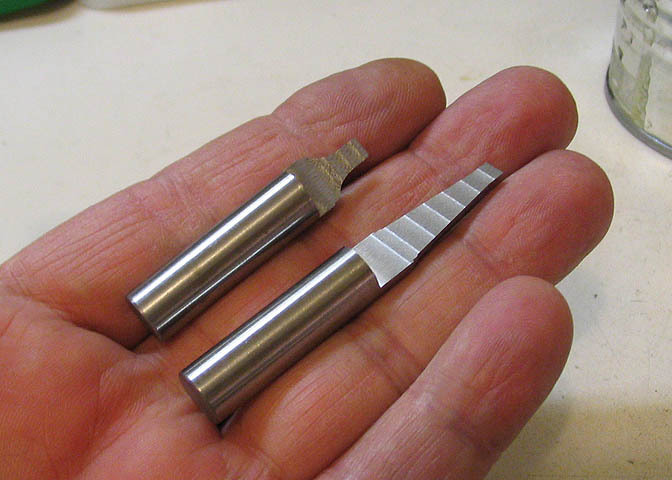 fluted reamer handy for boring truly round holes. 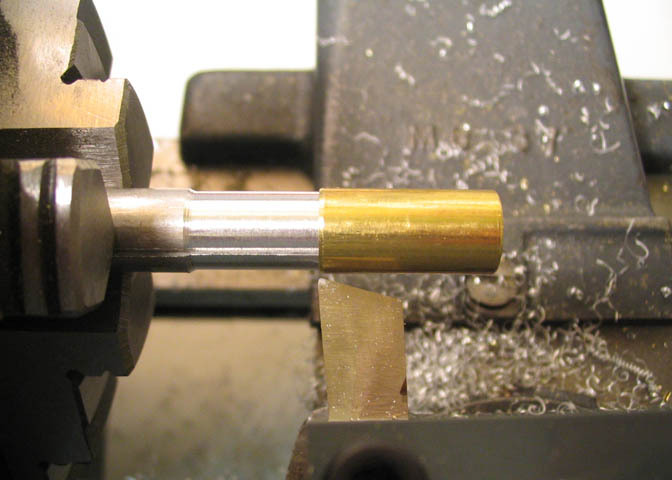 piece of drill rod to the diameter you need, instead of the profiled shape I'm using here. against it while milling the ends. the thickness of the piece when I'm done milling. 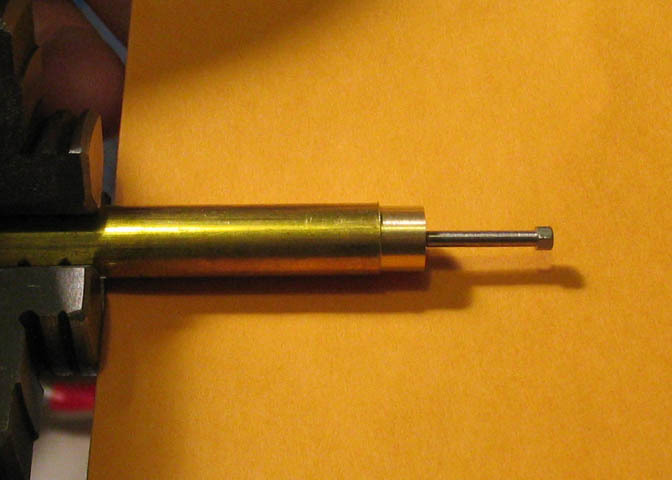 the drill rod to measure against with your micrometer. set up to cut the other end in the same manner. 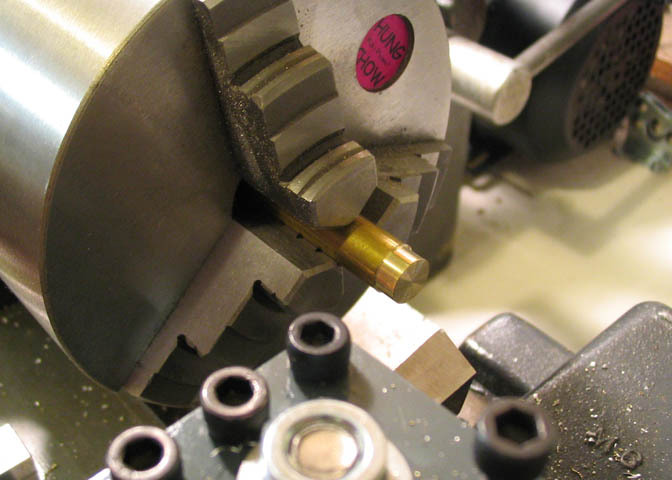 When the milling on the piece is done, I put it in a vise and cut it in half to get my two cutters. One for each end of the venturi. 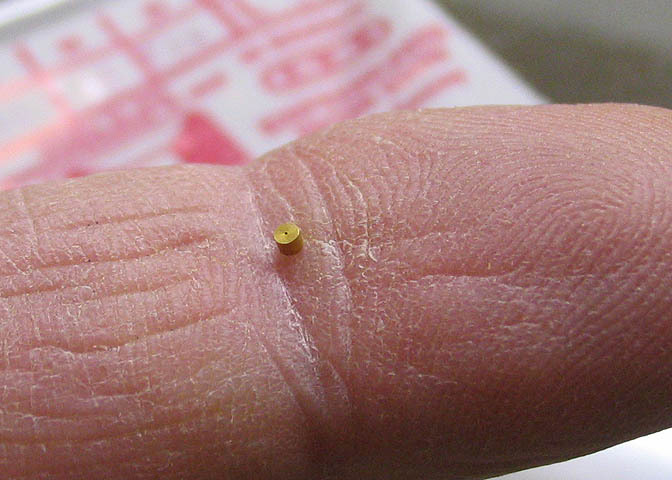 of the tiny burrs left from the milling process. The tool will already be sharp. You only want to hone it. Not grind it. Use a smooth hard stone. 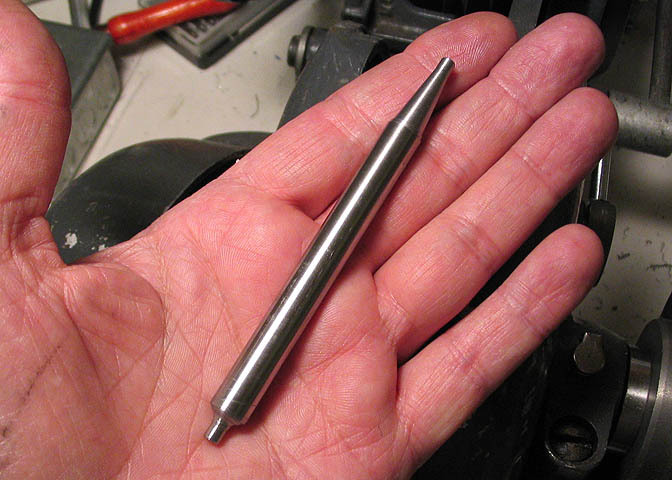 just like a regular fluted reamer that you can buy. 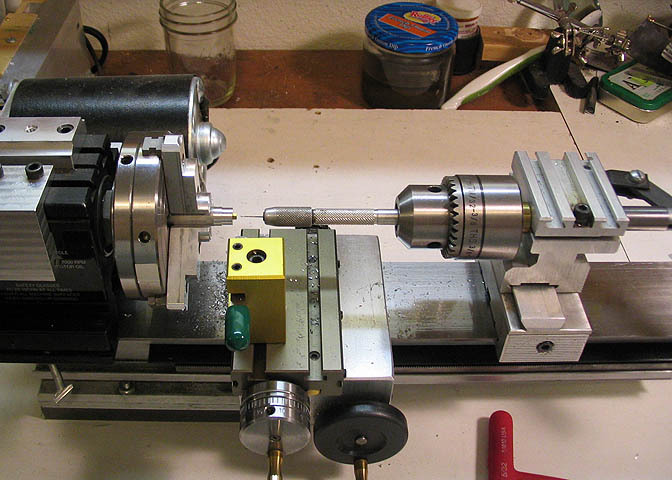 the tailstock ram just 1/16". 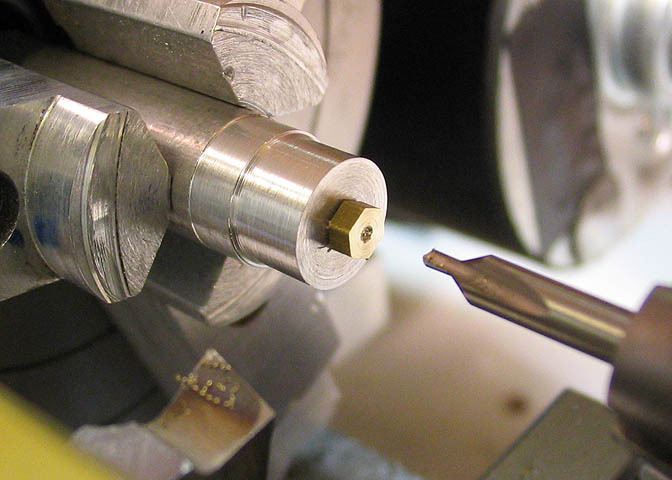 The D reamer has to be backed out often to clear chips, since it has no flutes. so easily seen with the naked eye. What I mean is, it's not as bad as it looks. the bell will form the low pressure area that makes these burners work.